An evening conversation piece in an opulent interior of Dr Cornelis and Mrs Henriette Hageman and their son Johan Jacob, she playing a giltwood single-manual harpsichord, he leaning on a chair and the child sitting on a cushion holding playing cards. Provenance: Passed by family inheritance to a private collection in Holland. Cornelius Hageman was born in 1714 and trained as a medical doctor in the Netherlands. 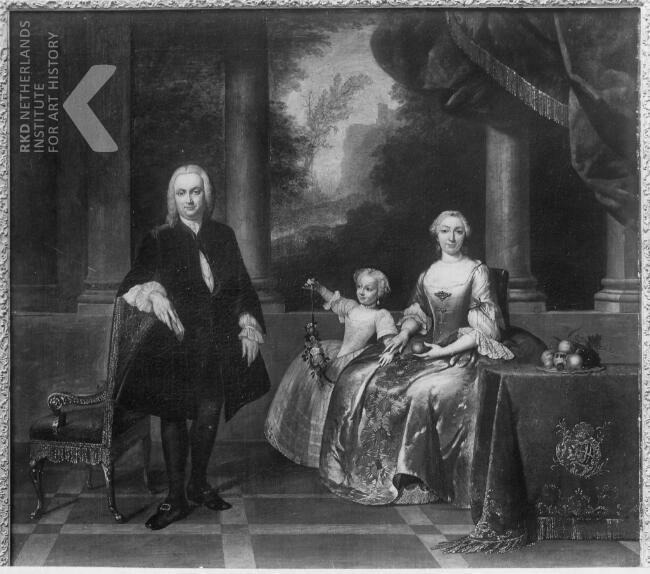 In 1745 he married in Amsterdam as his first wife Henriette van Heemskerk (1725-1748). Their only son Johan Jacob Hageman was born the following year at Amsterdam. She died in 1748. Cornelis re-married the following year (banns read Amsterdam 17th January 1749) to Alida Maria Swedenrijck (Christened 4th June 1728 in Amsterdam). Cornelis died before 1802; his wife Alida died in Bocholt in Limburg (in what is now north Belgium) in 1827. The couple had four children, the eldest son Eduard Hageman becoming a distinguished professor of jurisprudence and Latin scholar at the University of Leiden. 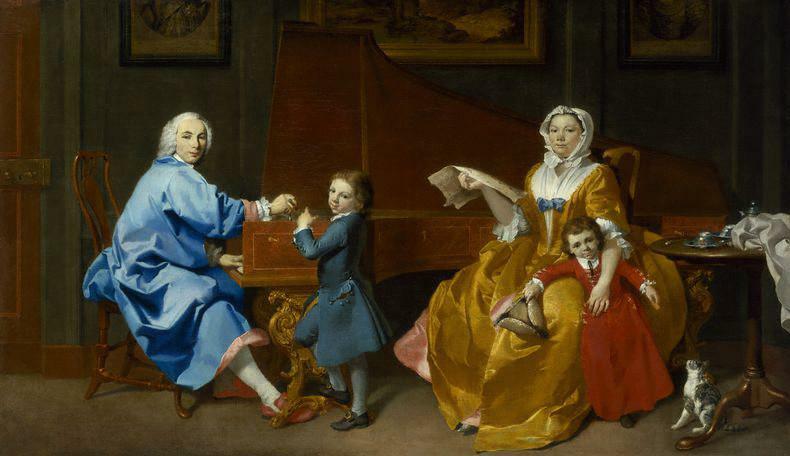 Schudi (1702-1773) was a Swiss harpsichord-maker long working in London who introduced many innovations into his craft. His instruments are considered amongst the finest ever made, and were supplied to many of the courts of Europe. 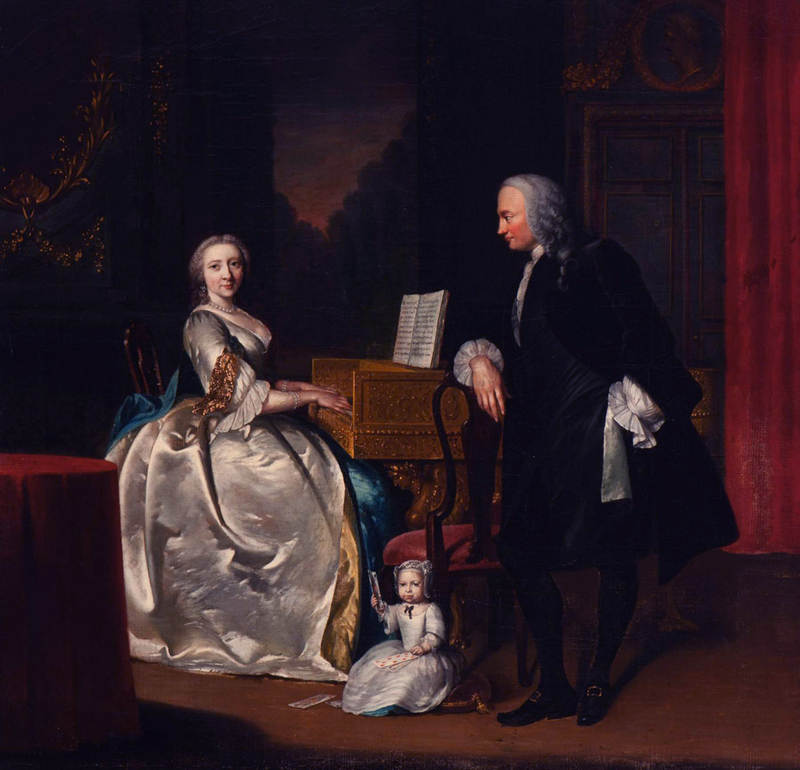 He was the employer and teacher of John Broadwood, (1732-1812) who later dominated keyboard making in England. Frans van der Myn was the son of the Dutch portrait painter Herman van der Mijn and was born when his father moved to Düsseldorf to work for Johann Wilhelm, Elector Palatine. He worked in Amsterdam during the years 1742-1748 (when the present picture was painted) and in the Hague. He moved to England with the rest of his extended family in about 1749. 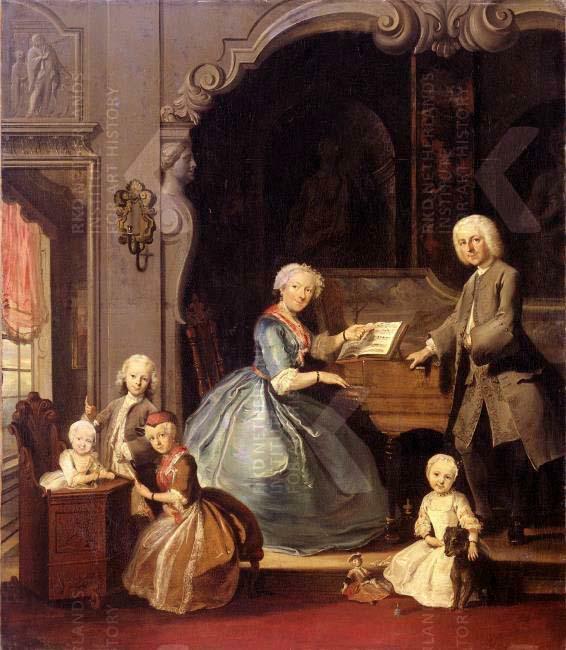 Cornelis Troost: family in an interior around a harpsichord. Signed and dated 1739 (Rijksmuseum) Image copyright RvKD, Holland. Van der Myn's conversation paintings of the 1740's strongly resemble the works of Troost, to whom on occasion they have been attributed.